What’s the first thing that comes to your mind when you think of the South of Spain? The Costa Del Sol? Resorts like Marbella and Torremolinos? Not for me. In my opinion, the best three things about the Costa Del Sol are Malaga Airport, Malaga Train station, and the Autovía Del Sur, as long as it’s heading in a northbound direction. If you really want to experience southern Spain then you have to head inland. It’s there that you’ll find flamenco culture, an Arabic legacy, spectacular cities and gastronomic excellence. All of these things are present in abundance in Córdoba, the city that I called home for eighteen months. It’s not as big and stylish as Sevilla. Nor is it as enviably located as Granada. What it is though is one of the most beautiful cities in all of Spain, if not Europe. Córdoba has been a significant city since Roman times. It’s therefore no surprise that most of its principal attractions are historical ones. First and foremost on most tourists list is the magnificent Mezquita-catedral. This stunning structure was built as a Mosque in the 8th century in the heyday of the Arabic kingdom of Al-Andalus. When Córdoba was re-conquered by King Ferdinand III of Castile in 1236, the building was adopted as a Catholic cathedral, which it is still used as today. Muslim style archways dominate the majority of the interior, whereas the Cathedral sits in the very centre, complete with an extremely elaborate altar. It’s an amazing juxtaposition and one that must be fairly unique in the world. As stunning as the interior of La Mezquita is, the building is at its best when viewed from outside. The views from the other side of the very dubiously named “Puente Romano” (Roman Bridge) are particularly spectacular. The narrow winding streets around La Mezquita are known as La Juderia; a reference to a time when there was also a significant Jewish community in Cordoba. The streets of La Judería are home to plenty of tourist shops and some excellent restaurants. On the edge of these streets, about two hundred metres from La Mezquita, you’ll find Córdoba’s other main tourist attraction, El Alcazar. An Alcazar is a type of fortress and you will find one in most Spanish cities. Indeed, Sevilla’s Alcazar is currently being used as the Dornish Water Gardens on “Game of Thrones.” At Córdoba’s Alcazar the building itself isn’t that spectacular. What does take the breath away though is the gardens. If there’s a more spectacular set of gardens in Europe, then I’m yet to find them. I may be biased but I think that they even beat The Water Gardens! At the centre of the gardens, another hint of Córdoba’s auspicious past can be found; a statue of Christopher Columbus petitioning Los Reyes Cristianos (The Christian Monarchs) Ferdinand and Isabelle. It was from this building that he planned his voyage to Asia, when he accidentally “discovered” America and claimed it for the glory of Spain. Other than these two main attractions, the best thing to do in Córdoba is just to wander the streets for a while. It’s such a photogenic city that glorious photo opportunities pop up around most corners. One rainy day option worthy of mention though is the Archaeological Museum. This provides an interesting insight to Córdoba’s many historical places of interest. Córdoba is packed full of fabulous little tavernas that serve the local favourites of salmorejo (a chilled tomato soup) and rabo de toro (stewed oxtail). There’s so many of these that to recommend just one or two would be futile. However, there is one place that every tourist in Cordoba should go to eat or drink. 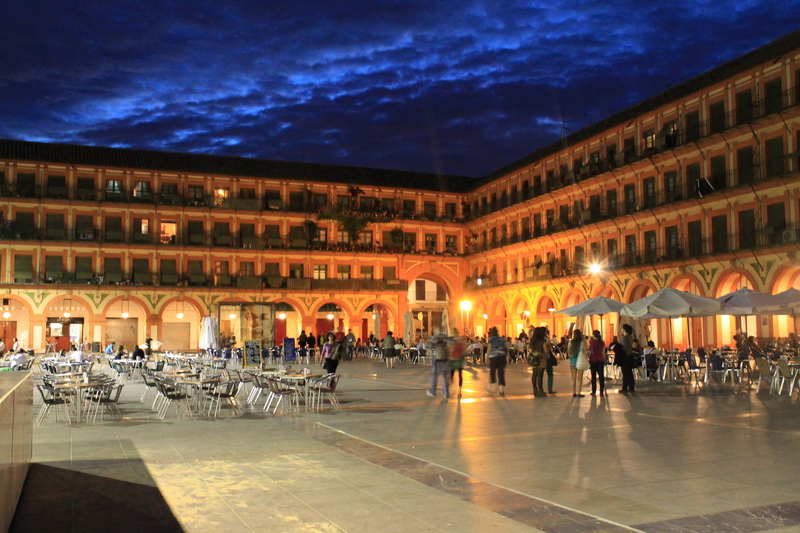 That place is the fabulous Plaza de la Corredera, which was recently voted as Spain’s favourite plaza. It’s easy to see why. On spring and autumn afternoons, and summer evenings it feels like the whole city is out on the Plaza. Many of my fondest memories of my time in Córdoba involve La Corredera, an ice cold beer and a few tapas. Simple yet wonderful. There’s a reason why people rave about the quality of life in Spain. If I said that Córdoba is a good year round destination, I’d be lying. Based on summer time temperatures alone, Córdoba is Europe’s hottest city. The mercury has been known to tip over fifty degrees on occasion. For this reason, many of the local population decamp to the beaches in July and August. This is not the time to visit! 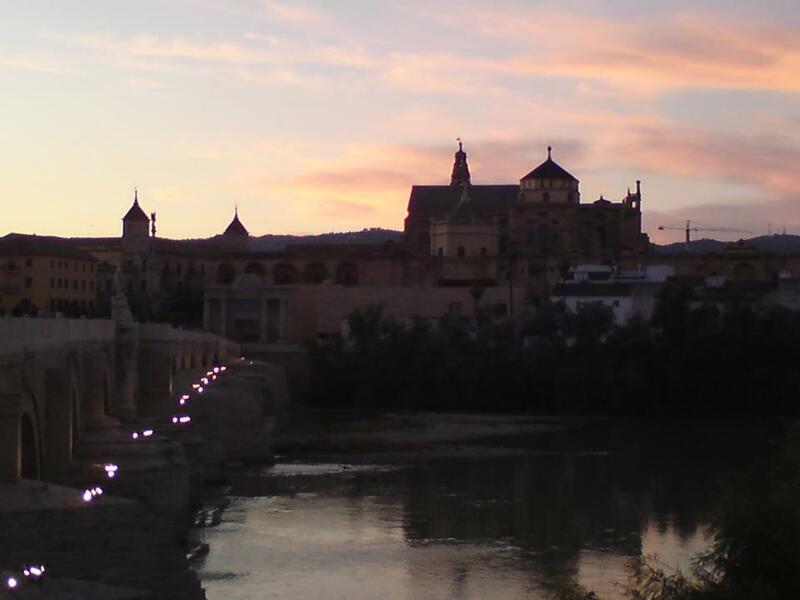 The best time of year to visit Córdoba, by a considerable distance is the month of May. It’s hot but not too hot. It’s also the time of the year when the city is in party mood. May starts with Las Cruces Mayo, a truly bizarre event when ornately decorated crosses spring up all over the city for three days. It’s officially a religious event, but for most people it just seems like an excuse to get pissed in the street. Next to all the crosses are bars selling beers and rebujitos, a cocktail made of sherry style fortified wine and sprite. Naturally. As May continues, the Patios competition commences. Many houses take part in this competition to see who can have the most ornately decorated courtyard. Again, it sounds bizarre but it’s a beautiful spectacle, and tourists flock from all over Spain to see it. Both of these events though are just the undercard. The main event of May is La Feria. This is when the Cordobés really let their hair down and party HARD for ten solid days. On a large patch of wasteland near the football stadium a fairground is erected. Alongside this, there are dozens of casetas, marquee style tents which serve food and booze and play flamenco or sevillanas. It can be a bit mind boggling at first and some casetas are more receptive to foreigners than others. However, unlike Sevilla’s feria, you don’t need an invitation to enter the casetas. Once you suss out which are the best ones, it’s impossible not to have a great time. One of the best things about Feria is people watching. The majority of the women, of all ages, wear ostentatious flamenco dresses. Some of the guys even dress up gaucho style and arrive on horseback. Truly this is Andalucía. Córdoba is a pretty compact city. If you aren’t visiting at Feria time, you only really need a couple of days to see the main sights. This is a city that rewards a more leisurely pace though, so why not stay a little longer? Wander the streets. Find a little hidden plaza. Eat some tapas. Drink some red wine. You might just fall in love with the place. I know I did. Cordoba te echo de menos. Have you ever tried something for the first time and wondered why you’d never tried it before? For me, that something was skiing. Until a couple of years ago I’d never had the opportunity to ski, except on something that resembled a giant brillo pad in deepest darkest Lancashire. 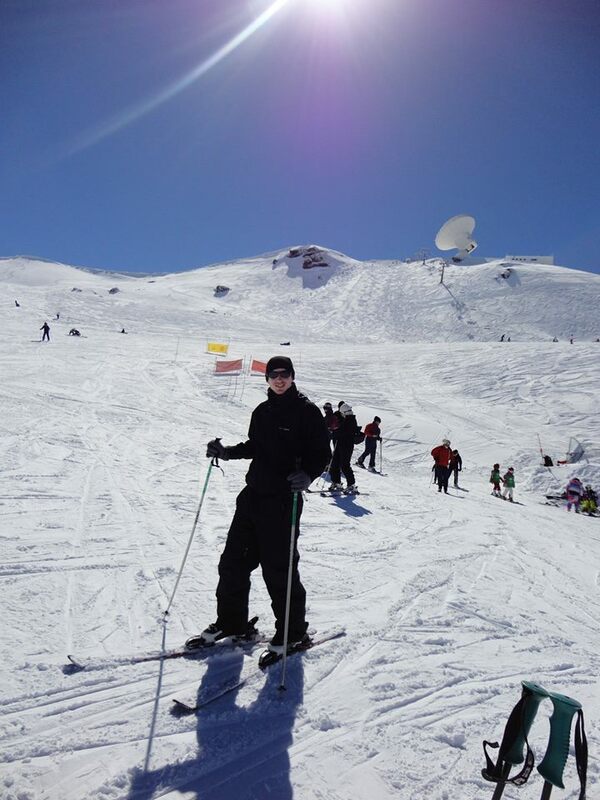 I never went on a school skiing holiday, and most of my travelling (despite my gingerness and near-albino skin) has been done in hot countries. 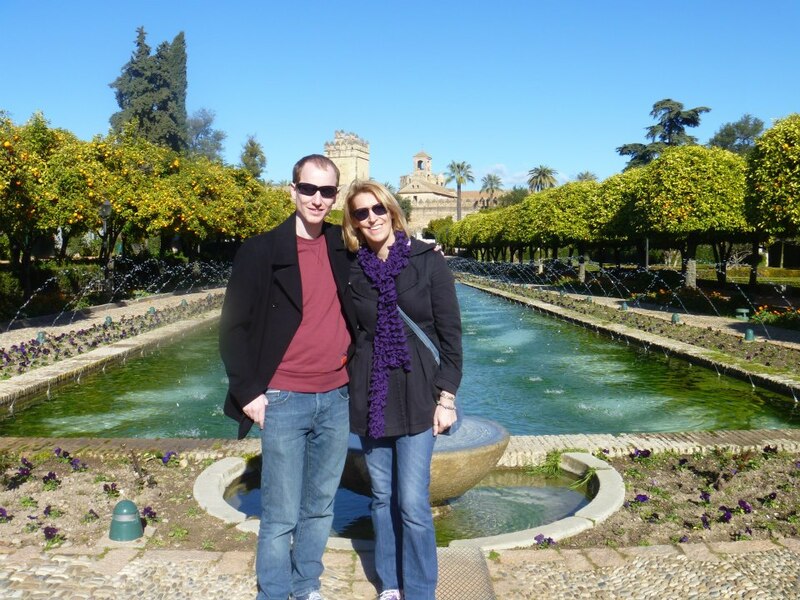 One February weekend in 2013 I went to Sierra Nevada, in Spain, and it was an instant love affair. Snow – great, fresh air – great, travelling very fast downhill – great, and the possibility to get intoxicated afterwards – great! Why had it taken me so long to try this?! Sierra Nevada is the highest ski resort in Spain, and the southernmost ski resort on Europe It is less than 100 kilometres from the Mediterranean coast, meaning that you could feasibly ski and swim on the same day! The resort is most easily accessed from the city of Granada. A bus from the central bus station there takes just 45 minutes to reach Sierra Nevada. The fact that it’s a relatively small resort makes it good for learning, as you’re not battling for piste space. We went on a puente (a Spanish public holiday weekend) and the slopes still weren’t too packed. Obviously, one does not just rock up and start skiing like a professional though. We had some basics to learn! We booked our tuition through the British ski center. Our instructor Giles was a veteran of about twenty ski seasons. He was extremely knowledgeable and had a calm demeanour. He was also very tolerant of my habit of crossing my feet and Janey’s confusion between her left and right. On the first morning we learnt the very basics; how to start, stop, change direction and how to do a snowplow. We considered ourselves very lucky that there had been a massive dump of snow the previous, so our many falls were adequately cushioned! The first day of the trip we made limited progress. It was the second day when the love affair really began. After proving ourselves on the nursery slopes, Giles took us on one of the lifts for the first time. Somehow we tentatively made our way to the bottom, with Giles looking uber cool, skiing backwards in front of us. After he left us, we went back for some more. I hit the deck again several times, Janey skied off onto a different piste. However, slowly, run by run it started to come together. Slaloming down the slopes with a crisp wind whistling past my ears, I felt truly alive. It was also just as exhilarating as any extreme sport that I’ve tried. After making it to the bottom unscathed several times, I felt like some sort of bossman, just for conquering a blue run. Then I realised that I couldn’t ski down to the town, as that run was too technical and I’d probably be looking at months of physio as a result. Still, there’s always next time for the red runs, then there’s the black runs. After that off-piste, then heliskiing in the Rockies, then who knows?! The Winter Olympics in South Korea in 2018?! Ok, maybe I’m getting slightly carried away but the point is, I REALLY caught the skiing bug badly! 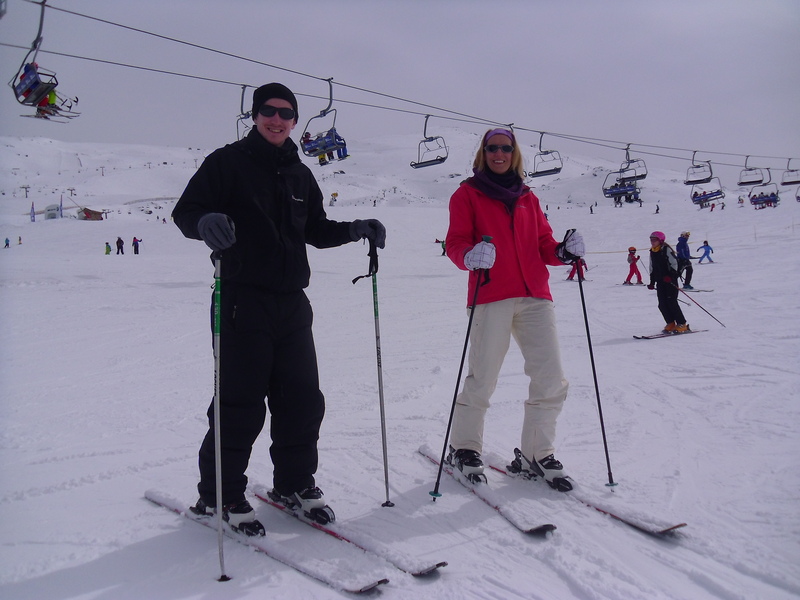 Janey and I both left Sierra Nevada determined to continue skiing. Since then fate got in the way, as our next job after leaving Spain, turned out to be in Malaysia, where I’m not sure if a snowflake has ever fallen. However, where there’s a will there’s a way. 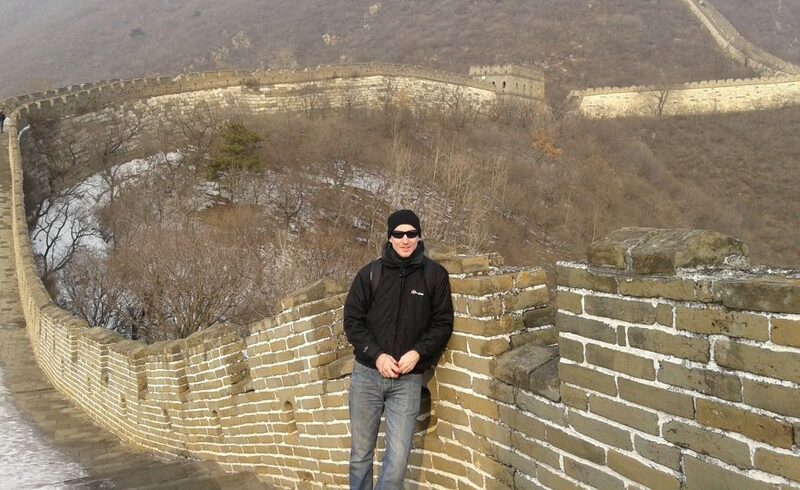 As soon as I arrived in the Orient, I was planning our next ski trip, to the world class slopes of Japan. It couldn’t come soon enough. I needed my next hit.